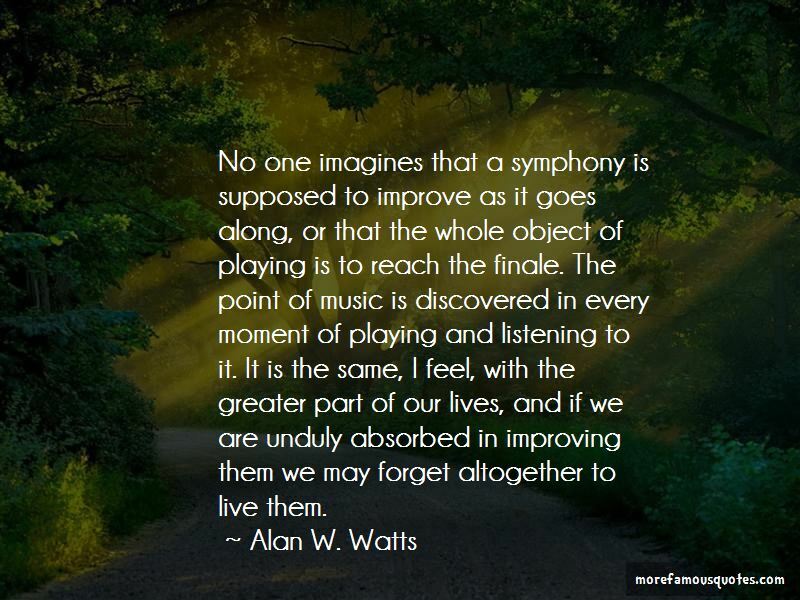 Enjoy the top 369 famous quotes, sayings and quotations by Alan W. Watts. Inability to accept the mystic experience is more than an intellectual handicap. Lack of awareness of the basic unity of organism and environment is a serious and dangerous hallucination. For in a civilization equipped with immense technological power, the sense of alienation between man and nature leads to the use of technology in a hostile spirit--to the "conquest" of nature instead of intelligent co-operation with nature. “Here's an example: someone says, "Master, please hand me the knife," and he hands them the knife, blade first. "Please give me the other end," he says. And the master replies, "What would you do with the other end?" This is answering an everyday matter in terms of the metaphysical. Life exists only at this very moment, and in this moment it is infinite and eternal. For the present moment is infinitely small; before we can measure it, it has gone, and yet it persists for ever. Life requires no future to complete itself nor explanation to justify itself. In this moment it is finished. When you find out that there was never anything in the dark side to be afraid of ... Nothing is left but to love. “But just exactly what is the "good" to which we aspire through doing and eating things that are supposed to be good for us? This question is strictly taboo, for if it were seriously investigated the whole economy and social order would fall apart and have to be reorganized. It would be like the donkey finding out that the carrot dangled before him, to make him run, is hitched by a stick to his own collar. Who believe more firmly in the Devil than in God are always afraid that if they let go, the Devil will take over first, unaware that not having let go is the Devil already in full control. It is really impossible to appreciate what is meant by the Tao without becoming, in a rather special sense, stupid. The idea that there are no wrong feelings is immensely threatening to people who are afraid to feel. This is one of the peculiar problems of Western culture: We are terrified of our feelings, because they take off on their own. We think that if we give them any scope, if we don't immediately beat them down, they will lead us into all kinds of chaotic and destructive actions. In the strictest sense, we cannot actually think about life and reality at all, because this would have to include thinking about thinking, thinking about thinking about thinking, and so ad infinitum. One can only attempt a rational, descriptive philosophy of the universe on the assumption that one is totally separate from it. But if you and your thoughts are part of this universe, you cannot stand outside them to describe them. Isn't it easy to see that this line is imaginary, and that it, and the witness behind it, are the same old faking process automatically learned in childhood? The same old cleft between the knower and the known? The same old split between the organism/environment and the organism's feedback, or self-conscious mechanism? The paradox about waking up-I mean the ordinary kind of waking up that occurred to you and me this morning-is that you can't make it happen, yet it's inevitable. The same holds true spiritually. You can't wish, pray, beg, force, or meditate yourself awake. If we want to keep the old language, still using such terms as "spiritual" and "material," the spiritual must mean "the indefinable," that which, because it is living, must ever escape the framework of any fixed form. Matter is spirit named. After all this, the brain deserves a word for itself! For the brain, including its reasoning and calculating centers, is a part and product of the body. It is as natural as the heart and stomach, and, rightly used, is anything but an enemy of man. But to be used rightly it must be put in its place, for the brain is made for man, not man for his brain. In other words, the function of the brain is to serve the present and the real, not to send man chasing wildly after the phantom of the future. Western science has made nature intelligible in terms of its symmetries and regularities, analyzing its most wayward forms into components of a regular and measurable shape. As a result we tend to see nature and to deal with it as an "order" from which the element of spontaneity has been "screened out." But this order is maya, and the "true suchness" of things has nothing in common with the purely conceptual aridities of perfect squares, circles, or triangles - except by spontaneous accident. Yet this is why the Western mind is dismayed when ordered conceptions of of the universe break down. and when the basic behavior of the physical world is found to be a "principle of uncertainty. 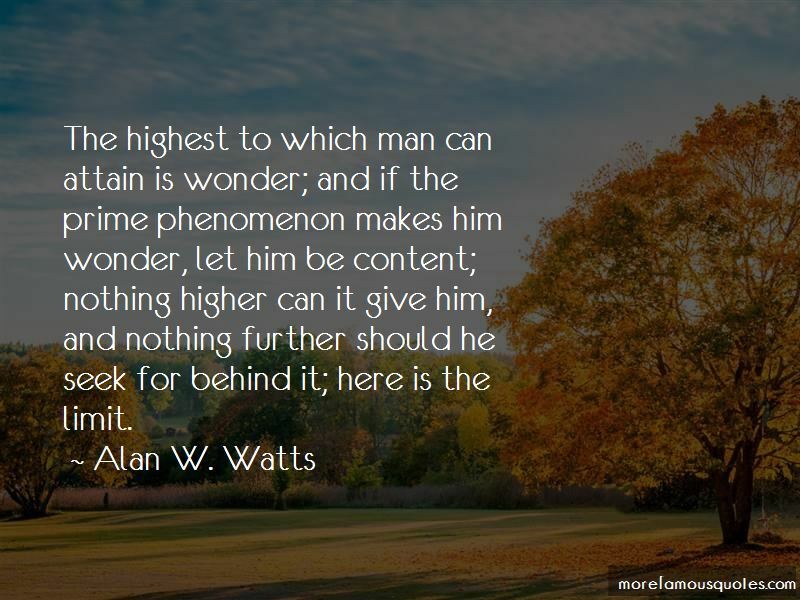 The highest to which man can attain is wonder; and if the prime phenomenon makes him wonder, let him be content; nothing higher can it give him, and nothing further should he seek for behind it; here is the limit. We do not need a new religion or a new bible. We need a new experience-a new feeling of what it is to be "I." The lowdown (which is, of course, the secret and profound view) on life is that our normal sensation of self is a hoax, or, at best, a temporary role that we are playing, or have been conned into playing-with our own tacit consent, just as every hypnotized person is basically willing to be hypnotized. The most strongly enforced of all known taboos is the taboo against knowing who or what you really are behind the mask of your apparently separate, independent, and isolated ego. God is the Self of the world, but you can't see God for the same reason that, without a mirror, you can't see your own eyes, and you certainly can't bite your own teeth or look inside your head. Your self is that cleverly hidden because it is God hiding. You may ask why God sometimes hides in the form of horrible people, or pretends to be people who suffer great disease and pain. Remember, first, that he isn't really doing this to anyone but himself. Remember, too, that in almost all the stories you enjoy there have to be bad people as well as good people, for the thrill of the tale is to find out how the good people will get the better of the bad. 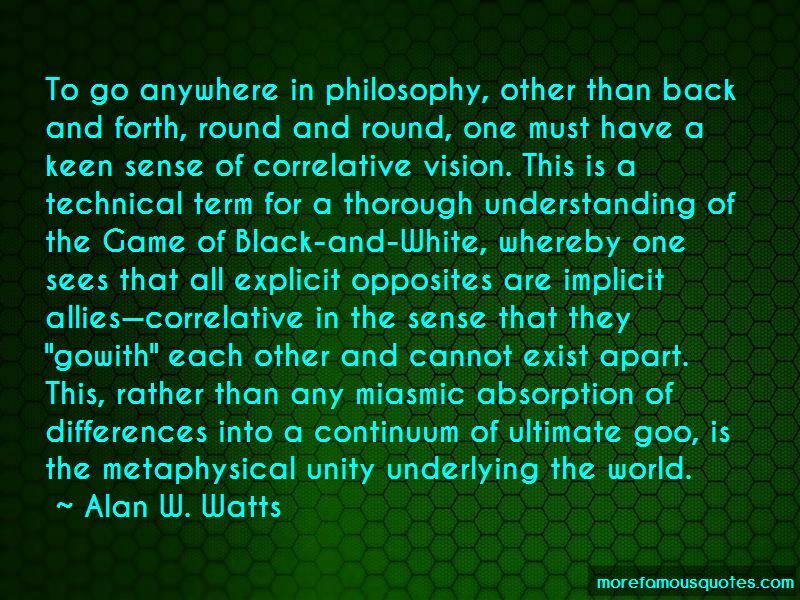 Want to see more pictures of Alan W. Watts quotes? 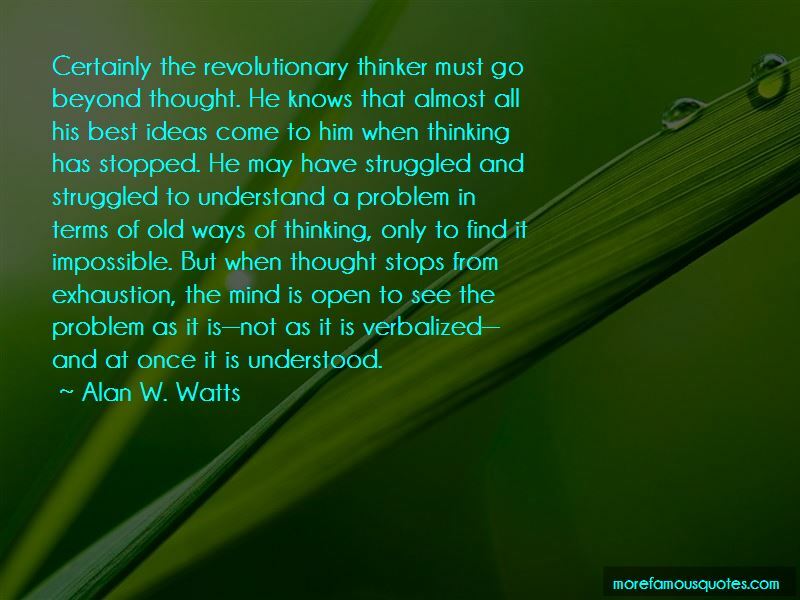 Click on image of Alan W. Watts quotes to view full size.